It's Day One at Amazon… again. When Jeff Bezos speaks, investors should listen. Look no further than Amazon's (NASDAQ:AMZN) recent returns as proof he's one of the greatest CEOs of all-time. "Day 2 is stasis. Followed by irrelevance. Followed by excruciating, painful decline. Followed by death." Paranoid much? Maybe, but just because you're paranoid doesn't mean someone isn't trying to kill you. And in capitalism, someone is always trying to kill you (or, at least steal your slice of the pie). Here are four techniques Bezos gives to stay a Day One company, and my biggest takeaways as both a business observer and Foolish investor. "Customers are always beautifully, wonderfully dissatisfied," Bezos writes. By being obsessed with pleasing customers in ways they don't even ask for – and thus can't articulate in a survey – Amazon is able to come up with revolutionary ideas that the consulting and survey-- based competition can't match. For instance, no one ever asked for Amazon Prime in a customer survey. It was introduced in 2005, with great skepticism. Still, Bezos kept at it, and Prime hit maintstream in 2014 when members grew 50%. That has kept North American retail sales not only high, but accelerating. Amazon's North American retail segment grew 25% in 2016, a higher rate than the 23% in 2014, and off a much bigger base. Bezos stresses companies must not get bogged down in process at the expense of outcomes. "Resist proxies," Bezos writes. "If you're not watchful, the process can become the thing." While not dismissing beta testing or surveys, Bezos writes great customer experience comes from "heart, intuition, curiosity, play, guts, taste." Not exactly something they teach you in finance class. While big, disruptive trends are not hard to spot, Bezos writes they can nevertheless be difficult for large organizations to embrace. Amazon is certainly a large organization, at over 341,000 employees. While Amazon began as a mere book-seller, today artificial intelligence pervades much of the company. Management's nimble nature and willingness to adapt has kept the company at the forefront of major tech trends. Its Alexa smart assistant has been a massive hit and its Echo hardware has been hard to keep in stock, with some estimating the company sold 7 million units in 2016, more than double the company's original projection. Not only that, but AI is also improving Amazon's core business with search recommendations, demand forecasting, and other aspects of "old" Amazon. Amazon's rapid embrace of AI gives me confidence that even if we are destined to be enslaved by robot overlords one day, it's likely Amazon will be the company making the best robot oppressors around. "Watch this space," Bezos writes. "Much more to come." Bezos talks here about not only making good decisions, but making good decisions quickly. "Speed matters in business," Bezos writes. "Most decisions should probably be made with somewhere around 70% of the information you wish you had. If you wait for 90%, in most cases, you're probably being slow." Instead of wearing each other down with exhaustive debates, he often "disagrees, yet commits," to a course forward, and will correct later on. Beyond the business lessons, there is a great takeaway for investors in these quote from Bezos. 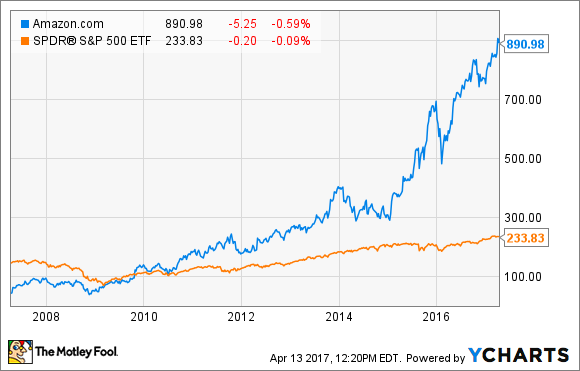 As Amazon's share performance teaches us, one big winner held over the long term can make up for a lot of losers. I can't tell you how many retail and professional investors I've known who have missed out on big gains because they could not get to 100% certainty on a stock, or were too scared to act, even though they were delighted by a company's products or services. Legendary investor Peter Lynch once wrote, "there is always something to worry about," , and that retail investors familiar with a certain company could actually have advantages over professionals. Do your homework, but don't be afraid follow your instincts and act with 70% certainty. Like the many projects Bezos and team are working on to expand Amazon's empire, not all investments will pan out, but that's why you spread your bets across several opportunities and let the winners create long-term growth.